Businessman Steve Hagerty and Ald. Mark Tendam (6th) speak Feb. 7 at a mayoral debate. The two candidates have started to shift the focus of their campaigns toward next month’s general election. Businessman Steve Hagerty and Ald. Mark Tendam (6th) have begun to shift the focus of their mayoral campaigns toward next month’s general election, rallying additional volunteers, raising money and working to differentiate themselves from their opponent. 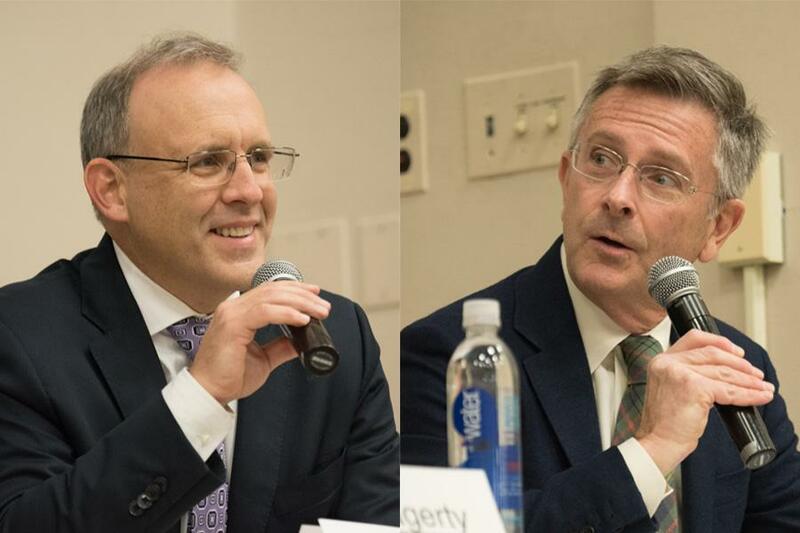 While neither campaign has settled on a definitive campaign strategy, both teams said they would focus on wooing supporters of the three other primary candidates and sharing more detailed policy plans at future forums. In Tuesday’s primary, Hagerty won roughly 44 percent of the vote, with Tendam carrying about 20 percent. Both candidates said they intended to review precinct-specific data to see where they could most improve. Hagerty said he looked forward to detailing a “broad array of issues” to voters during one-on-one forums in the general election. In the primary, where he was competing against four other candidates, he said he had not been able to entirely make his case. Since the two candidates are ideologically similar — both have prioritized affordable housing, economic development and youth empowerment — they must look elsewhere to stand out. Both candidates have experience with government, but Tendam said his opponent’s work has been largely in the “for-profit” sector. Hagerty has worked in emergency consulting for most of his life and owns an Evanston-based firm with more than 100 employees. But Hagerty said his consulting experience would serve as a “huge well” from which he will draw ideas to improve the city. Virginia Mann, a Tendam supporter running for his seat as 6th Ward alderman, said voters’ perceptions of Hagerty had been largely shaped by advertisements. During the primary, Hagerty contributed about $90,000 to his campaign while Tendam contributed roughly $15,000, according to data from the Illinois State Board of Elections. Mann added that Tendam would likely pick up votes from supporters of the other three primary candidates — none of whom have announced an intention to endorse. But Sean van Dril, a McCormick senior who works for Hagerty, said the primary illustrated broad support for his candidate’s message. He said Hagerty had a slew of “pragmatic skills” that set him apart from Tendam and “uniquely” qualified him for the position. Evanston residents will decide between the two candidates on April 4, in addition to voting in races for city clerk and six of the nine wards.